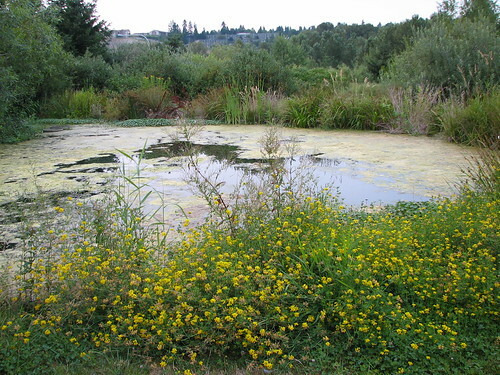 The most recent of the three Washington State earthworks that I visited on my earthworks tour is the Lorna Jordan Waterworks Garden from 1997. 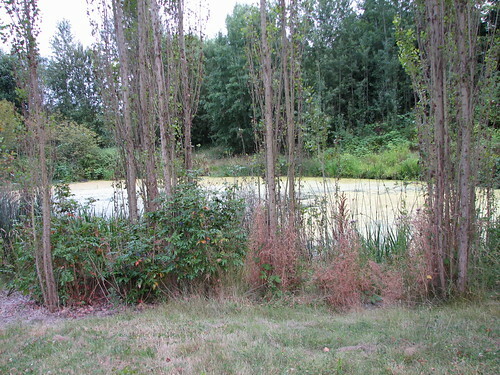 Of the three earthworks I’d visited on this day this one in Renton WA was the only one I’d been to before. It is more or less on the route between the Lake Washington Loop and the Interurban Trail and I the first time I ever rode on the Interurban Trail I had checked out the park. I usually never had much time, either on my way somewhere else or reaching it at the end of a longer ride so this was the first time I took the opportunity to really explore it. It was though toward the end of the day and the sun was sinking into smoke filled skies (making for a rather apocalyptic looking sun) . This does lead to some of my photos being a bit blurry as the sunlight waned. Waterworks Garden is the most intricate of the three earthworks, with five separate garden “rooms” each with a distinct character to them. The once again excellent Earthworks pages on the city of Kent’s website contains a decent overview on Waterworks Garden and Lorna Jordan’s website features pictures that showcase it in its prime (note that this is a Flash site and I can’t link directly to the Waterworks Garden pages. They are located under the Portfolio heading). Being built so much later then the other earthworks it incorporates decades worth of of theory and practice in the making of earthworks, which has by this time fully absorbed the reclamation theme which Robert Morris wrote about (which is s0mething you don’t see in pieces such as Smithson’s Spiral Jetty, De Maria’s Lightning Field or Serra’s Shift). Jordan’s particular muse is water and her pieces often work with the material in context of reclamation: this piece for instance is a wastewater treatment plant. The Garden is on a hill and the water is presumably pumped up there and then gravity pulls it through the various treatment ponds that make up the combined artwork/processing plant. The entrance at the top is a very ceremonial garden whose large monolithic columns give it the feel of a Stonehenge or BrÃº na Bóinne. Artistically cut out sections of tile with rusted grates over them makes the presence of water felt amongst this stonework. 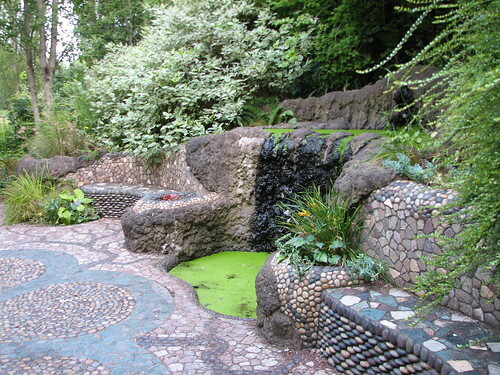 This garden and the Grotto are the most obviously shaped and have a more public art feel. In between these two are the much more earthwork style portions of the piece. The second garden is a series of larger pools which begin the stormwater treatment. A path wends its way through these pools, each one descending down the hill. From the Funnel, the open ponds become smaller and more in trees and then you enter the Grotto. Even more so than the Knoll, the Grotto is through and through a sculpted garden that wouldn’t be out of place in a formal English garden. A rounded space with fountains and pools of water that are allowed to have brilliant green scum floating upon them. 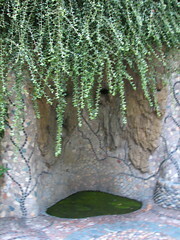 The Grotto is constructed from concrete (or shotcrete apparently) in the shape of a seedpod and is finely detailed on every surface. Nature in the form of trees, vines, shrubs and the aforementioned pond scum has been allowed to run rampant making the Grotto even more mysterious as if you had found an abandoned garden in the woods. A nice tranquil spot in the middle of this earthwork it does once again embody the overall feeling of neglect that I experienced at all of these earthworks. Being more of a park than Robert Morris”˜ Untitled Earthwork it is closer to the Mill Creek Canyon Earthwork and had about the same level of neglect, though not the amount of trash that had piled up there. It is instructive to look through the City of Kent Earthworks Site and other resources to see how these earthworks looked in their prime. Each of these earthworks cut shapes into the terrain that is mostly obscured due to overgrown plants (though the goats seem to keep Morris’ earthwork in an approximately original condition). "The Passage", the fourth garden of Waterworks Gardens. The last two gardens The Passage and The Release are the filtering of the processed stormwater into a wetland and are harder to take distinct photographs of. The Passage is akin to walking on a path through a wetland, with shallow lakes, swampy regions, marsh grasses and other flora that you’d find in these areas. The Release was pretty wooded and became a stream eventually, the final release of the water back into nature. On Lorna Jordan’s site you can see pictures, maps and models that show all of these areas a lot clearer than I was able to photograph them. The park also contains the Springbrook trail which connects to other regional trails. Its a great park with a combination of the artwork mixed with the water reclamation and recreation. Well worth visiting and makes for a nice way to begin or end one’s earthworks tour. This is the last of the three earthworks I visited on my August 1st earthworks tour. There is however a fourth earthworks I’ve visited on Mercer Island which I plan to revisit and write up at a later date. 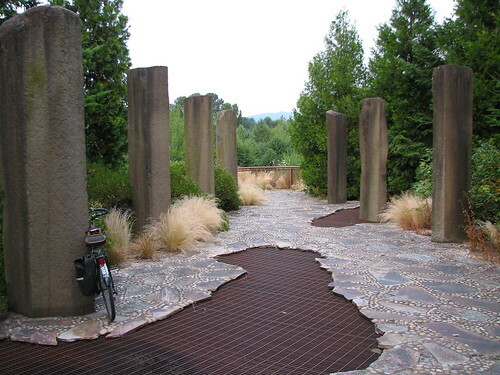 Check out all of my pictures of the Lorna Jordan Waterworks Garden on Flickr. Read all of my posts about Washington States Earthworks. A Spiral Cage is powered by	WordPress 4.6.14 and delivered to you in 0.278 seconds using 24 queries.